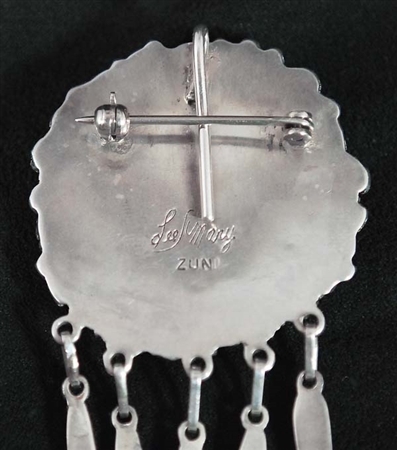 Lee and Mary are considered, two of the most accomplished silversmiths in the history of Zuni arts. They started working together in the late 1940's, with Lee doing the silver work and Mary doing the stone cutting. This beautifully designed pendant/pin offers the best of their cluster work, with an array of meticulously set multi colored, natural stones. 17 perfectly cut stones are placed in a gorgeous silver frame. 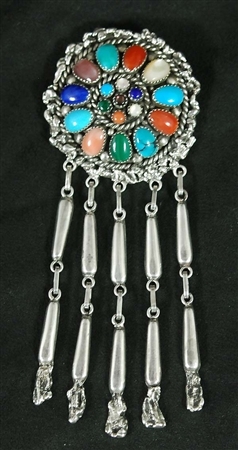 The pendant measures 1 3/8" diameter and is 3 3/8" long. Hallmarked, Zuni, Lee/Mary. Their work is published in Zuni Jewelry, the Art and the People, Vol 1 & 2, by Barbara and Ed Bell. Theda Bassman, Northland Publishing Company, Treasures of the Zuni. Theda and Michael Bassman, Zuni: A Village of Silversmiths, University of New Mexico Press. Barton Wright, Hallmarks of the Southwest, Schiffer Publishing LTD, 2000. And many more.